It's like a kick in the mouth! 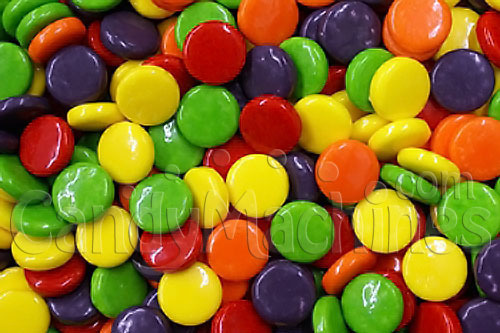 Hard candy coated Chewy Spree by Willy Wonka...perfect for vending in machines with an adjustable candy wheel. Crowd favorite in eye-catching, bright colors. It comes in an abundance of mouthwatering fruity flavors such as Orange (Orange), Strawberry (Red), Sour Apple (Green), Lemon (Yellow), and Grape (Purple). Need a machine to vend these chewy candies? Be sure to see our full line of candy vending machines. Sample a pound or two of this candy if you're not ready to purchase in bulk. Made by Nestle, these candies typically vend for 25¢ in commercial vending machines that have an adjustable candy dispensing wheel which controls the number of pieces that vend per quarter. They will also dispense in our candy banks and dispensers. Candy is best stored in a cool, dry, low humidity location. Their shelf life can be up to 18 months if not exposed to extreme hot or cold temperatures. Always easy to order, always ships quickly.